In Argentina, Chile or Uruguay. Invest in Argentina Real Estate an up running opportunity with a future, a recommendation by Bob Frassinetti Copyright 2009 Updated 2014 Roberto Dario Frassinetti. Art and Antiques to the world....... exporting to the world. Export Import Art and Antiques from Buenos Aires and Argentina For more than 5 years now, Argentina has been a recognized paradise for collectors, dealers and auctioneers. The uniqueness of this paradise lays on the fact that it opened its doors to the world after the crack in 2001, when the Argentine Peso value dropped dramatically in the international market. Featuring a truly appealing quality and quantity of items within its market of all sorts of collectibles ranging from Toys to Tractors, from Modern Art to Classical sculpturing, Argentina has what it takes to become the “it” place for art, antiques, collectibles, design and fashion. It is not a novelty that these features are now well known around the globe, and that the flow of this particular kind of trade has grown geometrically in recent years. However there are indeed novelties within the procedures in these exportations. Form a fairly simple and uncontrolled shipment during the first couple of years to the recent modifications in the norms and requirements, a lot of water has run under this bridge. We want to state that it is neither impossible nor hard to do, but requires an in depth knowledge and a good contact and with a net work operation with your Broker here in Argentina who will guide you threw the process. A container is not just a container, but what it carries within, and each container to be shipped off has a modus operandis to follow according to what the exportation is. Meaning: it is not the same to ship off a 20 feet container filled with antique furniture, than a container filled with artworks or a new fashionable clothing line, or even a classic car and an antique tractor have their own requirements and times. For starters it is important to state that the process of exporting is not immediate, this means that there’s some time involved in working out an exportation shipment out of the country, ranging from 1 to 3 months or even more… From helping you buy each and every single of the items that will be inside the container to packing it and working out the paperwork, we do it all as well as oversee each and every single step of the exportation. Once the items are bought, bare in mind it is important to get invoices from each shop you purchase at also you must know that funds should come in threw official channels. …….. Your purchases from each of the shop will be picked up and stored in a special warehouse because the total shipment has to be secured, controlled and each object photographed and controlled for export licence ….. Arts, Antiques, and collectiblest, depending the kind usually undergo a special treatment since the Government’s Cultural office demands that each of these items leaving the country has a permit stating that these are not stolen or protected pieces. This has to be carefully taken care of, because without the paperwork they will not allow the item to leave the country. Being that this business is new to Argentina in the broadness of its flow, regulations as well as paperwork and requirements might change and increase, the way they have in the last couple of months and years, until final requirements are set for good. That’s why it is so important to work with reputable firms who are constantly up-to-date in the ins and outs of these matters. 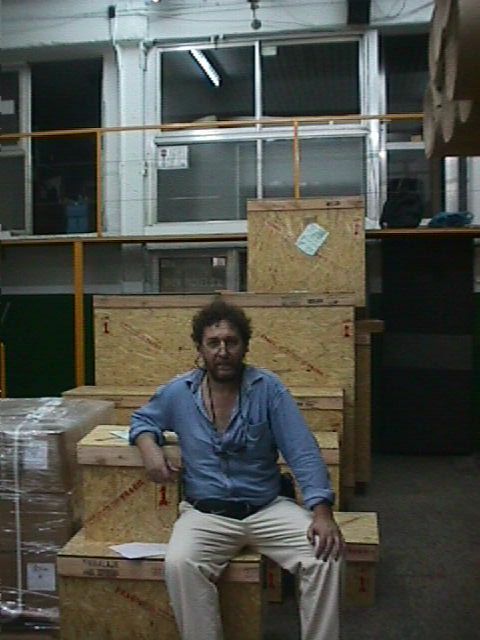 Once the items are approved, then they must be properly packed and handled. The packing has to be government approved, or else it won’t be admitted by the recipient country –US, Europe, etc, have very strong regulations regarding the receiving of packets from abroad that are not health approved. At this point, the boxes that will be filled into the containers must be sent to the Buenos Aires port for shipment, and Customs’ approval. Once fitted into the container, there’s a time gap until it finally is set in the ship, and that the ship sales off to the receiving port. Depending on the location the frequency of the shipping can be of twice a week to every day to once every two weeks… This is a brief insight on the current exporting process in Argentina, that will allow our readers to better understand the times and requirements in exporting from Argentina to the world. So if you are interested in Art or Antiques, and you are thinking of travelling to Argentina Chile or Uruguay please feel free to email me…….. Please feel free to contact Bob Frassinetti: For more information: Email: Bob Frassinetti. Press here to see all topics on Art, Antiques and Travel Information for Buenos Aires & Argentina:Everything on Art, Antiques, Collectibles as well as travel information for Buenos Aires, Argentina, Chile and Uruguay. Phone me thru Skype, ID: Bob_Frassinetti or you can also chat with me thru Yahoo, press here: Yahoo Contact Find me on MySpace and be my friend! Or Phone: +54 911 69651955 or in B's A's: 15 69651955 ) Invest in Argentina Real Estate an up running opportunity with a Future Read The Buenos Aires Art Dealer a e-zine magazine on Art, Antiques & Collectibles from Argentina. 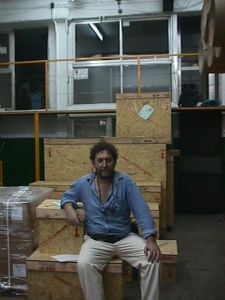 The Buenos Aires ArtDealer, Argentina. Bob Frassinetti and Exporting Art and Antiques from Argentina. Religions tours in Buenos Aires, Argentina. Visiting foreign lands and discovering pleasure in traveling is not an unhistorical activity, it actually dates from the Middle Ages. Back then, the main "tourist attraction" throughout the known world were Sanctuaries, such as Santiago de Compostela in Spain or Jerusalem in the Middle East among many others. It was back then, when locals who lived nearby the main roads to these pilgrim places decided to turn their house into a lodging for the travelers, or even turn the local tavern into a homey dinner. Here fore, ladies and gentlemen, there's one of the many origins of hotels and restaurants. If we consider these facts as an early beginning for tourism, then there's no novelty about the latest religious tours. They existed for hundreds and hundreds of years, for after those pilgrim places lost their initial strength there were some other new ones uprising. Rome and the Vatican city, as well as Belen and Jerusalem are fine examples of this sort of tourism. When I found about all this information I was amazed. It's really interesting to discover the beginning of a tradition that we've already take for granted. I actually had no idea of the power of Saints back in the middle ages. I found out they were somewhat a key to understand a very varied chirstianism. This mini investigation led me to some new doubts about Christianity and the way this religion has evolved throughout history. To my surprise, I not only got to understand a bit better one of the most important beliefs in society, I have a long lost relative that has been sanctified: Saint Paola Frassinetti. Awesome! isn't it? Her mother dies when Paola is only nine, and this young kid has to substitute her mother in all her labors. Life is hard to her, but she carries on helping her father and family. Her first Holy Communion and her brother Giuseppe's ordination are moments of deep reflection for her who already feels, in the depth of her heart, the divine call. She'll be patient and await until God's time. According to the Vatican biography on her "at the age of 19 she is physically tired owing to the strenuous rhythm which her life as a precocious mother imposes on her, and her brother, Father Giuseppe, who is parish priest at Quinto, offers her hospitality for some time. The pure air of Quinto proves beneficial to her delicate health. Parish life affords her the opportunity of doing good, as little by little, her gentle ways attract the youth of the neighborhood. Every Sunday they go to the woods to speak about God. These encounters occur often and soon other young girls join the group. Paula reveals to them the secrets of a life totally dedicated to God, and she discovers her vocation as an educator. An enthusiastic group which lives in communion of love, forms itself around Paula". The turns of life would take her to do her good through education and commitment to the Church, and soon the Sisters of Faith would become Sisters of Saint Dorothy when they take on Father Luca Passi's work when his time has come to join God in Heaven. In 1844 the Pope entrusts Paula with the direction of the Conservatory of S. Maria del Rifugio at S. Onofrio. By her gentleness and charity Paula transforms the place, and because of her presence and activity S. Onofrio becomes the Mother House. In 1846 an anticlerical spirit spreads throughout Italy. In Genoa even the Dorotheans are molested and the daughters of Paula are exposed to suffering. Persecution reaches Rome: Pius IX, who has succeeded Gregory XVI, is obliged to take refuge at Gaeta, and Cardinals, Bishops and Prelates all leave Rome. Paula remains alone. Paula feels that her earthly days are coming to a close. It is the dawn of June 11, 1882: She is serene, and her passing away is tranquil thus bringing into evidence the richness of her life, as she invokes the Blessed Virgin whom she has always loved so much: " My Mother, remember I am your child ". On June 8, 1930 Paula is declared blessed, and on March 11, 1984, the bells of Saint Peter's ring out again to announce that Paula is a Saint. What a fantastic story! I believe there are hundreds of these sort of life experiences that can be treasured and are of great interest. After knowing about this long lost relative of mine, I began to search the facts about Saints and local cults in Argentina. The result was fantastic, not only there are fabulous buildings related to it such as churches and masques, temples and sanctuaries, but the story behind each cult is fascinating. Taking two of the most extraordinary saint cults in Argentina there is the one on the Blessed Virgin of Itat¿, guardian of the Corrientes Province, and the annual peregrination to the Gauchito Gil Sanctuary also in Corrientes. This location, however is not a stop to the general admiration and devotion to these popular saints. During the last few years, they've extended from local cults to national proportions ones. And one is able to trace this spreading out down through route side small sanctuaries. The bond established with the popular public is unquestionable. At the same time, there's a conflict of interests established between the Church and these popularly sanctified characters. The situation is not new to Latin Americans specially, for their relationship with the Roman Church has been quite complicated since the beginning of colonial times, for the way local cults and beliefs blended and merged with the Christian cult has not always been approved by the hierarchy in Rome. It is not our job to judge this relationship or its implications, we just want to share with the travelers interested in religions some of Argentina's spiritual, social, cultural and architectural heritage linked to all these cults and religions. The cultural richness implied in these sorts of cults is amazing; and it opens up as an alternative door through which to understand and get to know the Argentina. Auction Tour for Art and Antiques here in Buenos Aires, Argentina. Auctions in Buenos Aires are a great option for collectors, art and antique dealers and gallery owners from around the globe. Bob Frassinetti Art & Antique Dealer has a specialized team that handles everything in terms of buying art, collectibles and antiques from auctions and shops, to hunting and customized touring services. The planning begins before you arrive to the city, with conversations, directions and market research of the style, art and antiques you’re looking for. From the minute you arrive to Buenos Aires we handle everything from picking you up in the airport, hotel reservations, auctions scheduling, hunts to off the path markets and fairs, discounts, shipping and handling all the paper work regarding the exporting of the works. This is a great opportunity to work with and take advantage, but the best way to take the most out of it is by planning and working in advance. So if you are interested in Art or Antiques, and you are thinking of travelling to Argentina Chile or Uruguay please feel free to email me……..
Or Phone: +54 911 4475 3983 or in B's A's: 15 4475 3983 ) Invest in Argentina Real Estate an uprunning opportunity with a Future Read The Buenos Aires Art Dealer a e-zine magazine on Art, Antiques & Collectibles from Argentina. The Buenos Aires ArtDealer, Argentina. Auction tours in Buenos Aires buying in the most prestigious auctions around the City of BA. So if you are interested in Art or Antiques, passing threw Collectibles and just to mention some like Advertising, Advertising Art, Architectural, Art Deco, Auto Parts, Badges, Banks, Beswick, Bottle, Bottle Openers, Bronze, Button, Calendars, Candy Containers, Carnival Glass, Chandeliers, Christmas, Coca Cola, Corkscrews, Elvis Presley, Ethnic Art, Ethnic Toys, Fans, Fishing, Fishing Reels, Folk Art, Francisco Adaro, Furniture, Lamps and lightning items, the wild 60's and 70's, Garden Furnishing, Girl Scout, Glass Art, Glass Contemporary, Golf, Halloween, Inkwells, Insulators, Ivory, Japanese Woodblock Prints, Jewellery, Judaic, Kitchen, Knife, Lamps, Lighters, Lightning Rod , Majolica, Match Holders, Medical, Motorcycles, Music, Napkin Rings, Nautical, Netsuke’s, Nutcrackers, Paintings, Liberato Spisso, born Buenos Aires, Argentina. 14 March 1903, Portrait Artist, Viski, Jean ( Janos ) 1891 - 1961, Old Car, Paper, Paperweights, Pens, Pencils, Pencil Sharpeners, Pepsi Cola, Perfume Bottles, Pewter, Phonographs, Photography, Postcards, Posters, Prints, Radio, Railroad , Records, Steam Tractor, Scientific Instruments, Sewing, Sheet Music, Silver, Souvenirs, Sports, Stero Cards, Stereoscopes, Telephones, Television, Tools, Toys, "The Buenos Aires Toy Museum. Argentina", Tractor, Typewriters, Watch, Weapons, Weather Vanes, Wood Carvings, Wooden, World's Fair, to say Wristwatches. So you can buy Toys from my museum and threw eBay, threw the Toy Museum on eBay press here; Toy Museum on eBay and thru The Buenos Aires ArtDealer, press here; Art Dealer on eBay From Art to Antiques. Please feel free to contact Flor Rodriquez by emailing her: Email: Flor Rodriguez. or Bob Frassinetti: For more information: Email: Bob Frassinetti. Press here to go back to web blog:Daily Updates on Art, Antiques, Collectibles as well as travel information for Buenos Aires, Argentina. Phone me thru Skype, ID: Bob Frassinetti or you can also chat with me thru Yahoo, press here: Yahoo Contact Find me on MySpace and be my friend!